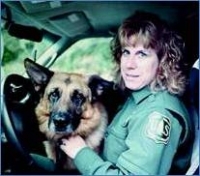 On Saturday, September 20, 2008 at about 1442 hours, Officer Kris Fairbanks of the U.S. Forest Service radioed in that she’d be out with a suspicious vehicle on Forest Service Road 2880, just past the Dungeness Forks Campground, off Palo Alto Road in the Olympic National Forest. The vehicle was a dark-colored 1978 Chevrolet van without license plates. Officer Fairbanks ran a name, Shawn Roe. After about ten minutes, communications did a status check on Officer Fairbanks and she didn’t answer. Troopers and Clallam County deputies responded to Officer Fairbanks’ last known location, arriving at about 1510 hours. She was deceased from gunshot wounds. Her K-9 partner, a German Shepherd named Radar, was still inside her patrol vehicle. There was evidence of a struggle that occurred outside the vehicles. The suspect took Officer Fairbanks’ 9mm pistol and fled in his van. It was determined that 36 year-old convicted felon Shawn Roe was the suspect in the murder of Officer Fairbanks. Fliers were soon being passed out around Clallam County in an attempt to locate Roe. At about 1745 hours, someone telephoned police to report that Roe’s van was abandoned in a densely wooded area. Detectives believe that after Roe left his van, he walked a short distance to where he murdered Richard Ziegler inside a fifth-wheel trailer. Ziegler, a retired California Department of Corrections employee, had never met Roe. After murdering Ziegler, Roe stole his white pickup truck. At about 2130 hours, a security officer from the nearby 7 Cedars Casino spotted Roe walking into the Longhouse Deli & Market located in Blyn, about three miles south of Sequim on Highway 101. The security officer called 911. Three minutes later, Clallam County Deputy Matt Murphy and Deputy Andrew Wagner arrived and confronted Roe in front of the store. They ordered him to show his hands, but he refused. Roe then pulled out a gun and began firing at the deputies. The deputies returned fire and killed Roe; firing nine shots total. The deputies were not hit. Roe had three handguns on his person when he was killed, along with a cache of other weapons inside the pickup. He was seen examining a wanted poster bearing his picture inside the deli shortly before he was confronted by deputies. Troopers at the scene of the shooting ran the pickup’s plate and drove to Ziegler’s property, where they located his body.  Officer Fairbank served with the United States Forest Service for 22 years. She is survived by her husband and daughter.